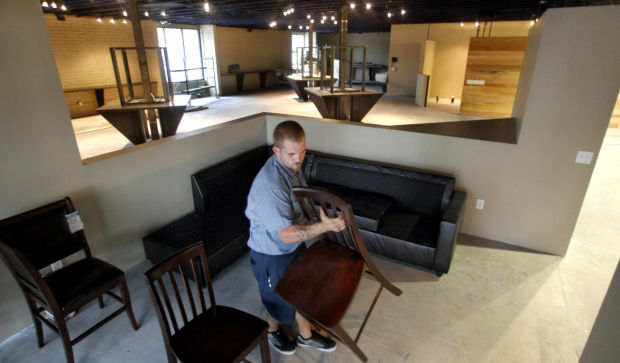 Joe Danjou of Sam Levitz Furniture brings in new chairs and a sofa for the waiting room for The Industry Hair Studio, 4045 E. Broadway, which is to open later this month. The 7,600-square-foot facility will be home to stylists, barbers, facialists, manicurists, a tattoo artist and a massage therapist. After more than 30 years of experience working as a stylist, Greg Yedding is rebranding his hair salon as a studio in an effort to help cosmeticians break into the industry. Yedding, 51, is the owner of The Industry Hair Studio, at 4045 E. Broadway, which will open in late July. He currently owns 4400 Hair Salon in the Broadway Towers at 4400 E. Broadway, which he will close as part of the rebranding. Independent contractors rent space from Yedding as an opportunity to learn from their fellow cosmeticians and build their businesses. Customers will be able to walk in or call in to make appointments with hair stylists, facialists, manicurists, barbers, a tattoo artist and a massage therapist. There will also be a car detailer available by appointment. "They're their own business within my business," Yedding said. Daisy Lebron has worked as a stylist for 28 years, including 10 at 4400 Hair Salon, and will be moving along with the business to The Industry Hair Studio. She says the staff has been together for 10 years and individuals have built their own clienteles at no expense to their colleagues. "We want to have a salon that is a community," Lebron said. "We help each other. We never have a competition." The 7,693-square-foot building will have 24 styling stations, two pedicure stations and two manicure spas. The building also has a tattoo parlor, two barber stations, a photography station and three spa treatment rooms. Yedding came up with The Industry Hair Studio name as a play on "breaking into the industry." He can relate to how difficult it is to start a business, as it took a stroke of luck for him to jump-start his career as a stylist. As the son of model and producer Ann Perry, Yedding spent most of his childhood on movie and television sets. When he was 17, he had the opportunity to do hair and makeup for one of his mom's photo shoots when the stylist did not show up. "The photographer liked what I did, so he talked my mom's production company into sending me to Paramount Studios to a makeup academy to learn how to do professional makeup," he said. Yedding spent eight years working on television and movie sets before he began working in salons. 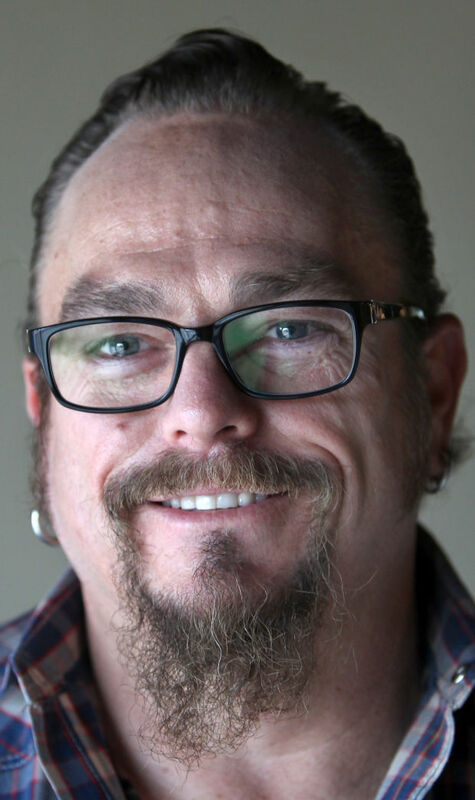 After spending 20 years as a stylist and owning two hair salons in San Francisco, he moved to Tucson in 2006 and bought 4400 Hair Salon a year later. Yedding has spent the majority of his career brainstorming ideas for The Industry Hair Studio, taking bits and pieces of his previous salons and combining them with ideas he's either seen or came up with. He began drawing out designs two years ago before purchasing the store location for $400,000 in 2012. He said he has spent roughly another $400,000 on construction costs. Local artists will have the ability to display their work in the studio, while there will also be a Wi-Fi bar and kids room, allowing customers a place for their kids to play while they're getting cosmetic work done. Yedding hopes that offering all these amenities will make his business a convenient place for customers. "We have clients that go somewhere else to get their nails done or get their facials done," he said. "Why not do it here?" I recently had a color, trim & highlights at a new salon, new for me. Greg was my stylist and he is truly amazing. I am going through the process of my hair growing out which is quite difficult. The color was just what I wanted, very natural looking. I received many compliments. My hair has never looked better. Greg also taught me how to use different products to manage my hair. I highly recommend Greg, very professional, a color expert who has a great personality!